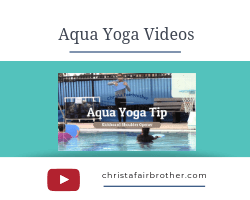 One of my goals for 2019 is to produce a weekly aqua yoga video to promote awareness about aqua yoga and it’s amazing potential. The videos are not designed to be done in a sequence or in any order, just as examples of the diversity of practice options. Every practice should include a twist, as it’s one of the natural ranges of motion that helps your spine warm up. In today’s tip, I’m sharing some feet placement options to challenge your balance. – inside edges of the feet together, heel to toe like on a tightrope, crossing the legs bringing the outside edges of the feet together. This week’s tip is Goddess Pose. This is a great pose for releasing and relaxing your hips so it’s good to put in after a more challenging posture. This barbell variation challenges your core stability and arm strength too. Learn all the skills to move your yoga practice into the pool. Now enrolling for our April 13th start date. How to add arm variations to Goddess Pose. The buoyancy of the barbells challenges your ability to stay centered and grounded in the posture. See last week’s aqua yoga tip for general Goddess pose directions. Enjoy using these videos in your pool time!